Posted on Mon, May 7, 2012 : 4:47 a.m. Here's another healthy and easy-to-prepare recipe. The vinaigrette works overtime serving as a marinade for the salmon and a dressing for the greens. 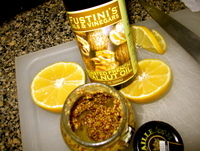 I choose the heady flavor of Fustini Walnut Oil, available in Kerrytown shops, and combined it with my favorite mustard for making vinaigrettes: Maille course or smooth Dijon. A bit of shallot macerated in the acidity of a good red wine vinegar was all the dressing required. I prefer the greens lightly dressed; the mache salad green mix I purchased from Hiller's was piquant and could hold its own. 2. Whisk together oil, lemon juice or vinegar, shallot (if using) and mustard; season to taste with kosher salt and freshly ground pepper. 3. Prepare a sheet pan with lightly oiled foil. 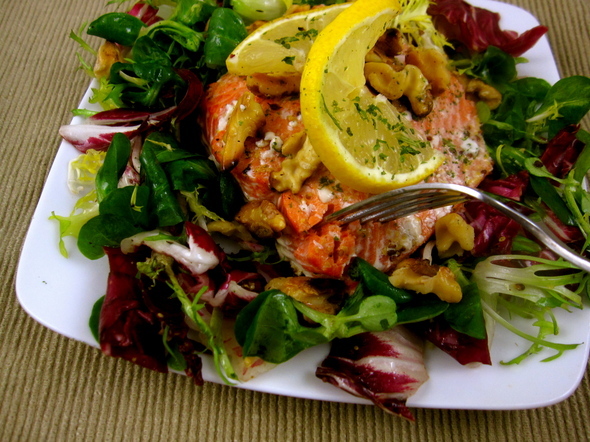 Place salmon on foil and brush with 2 tablespoons of the dressing. Let sit at room temperature 15 minutes, then roast 10-15 minutes on center rack of oven until cooked to desired level of doneness. 4. Toss greens with remaining dressing and season with kosher salt and freshly ground pepper, if desired. Divide and plate greens and serve salmon atop greens, seasoning salmon with additional salt, if desired.